While waiting for parts to come in for SAGAR, I decided I’d kill three birds with one stone. 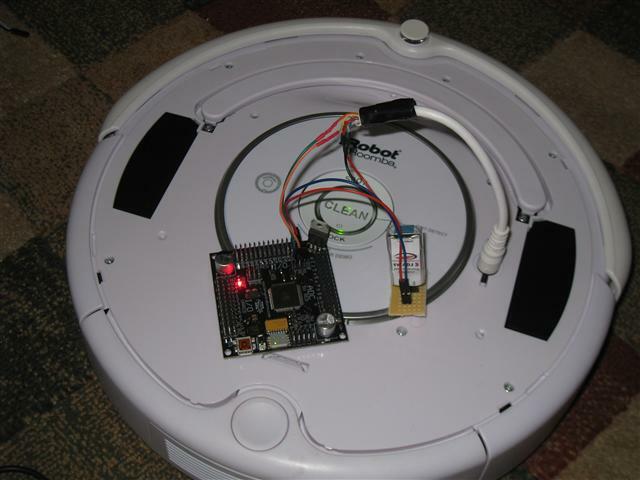 I wanted to adapt my Irobot command code to be compatible with Webbot’s Lib, I wanted to test Webbot’s new Project designer, and I wanted to try out a Force Field Obstacle Avoidance Algorithm. This is what I came up with. 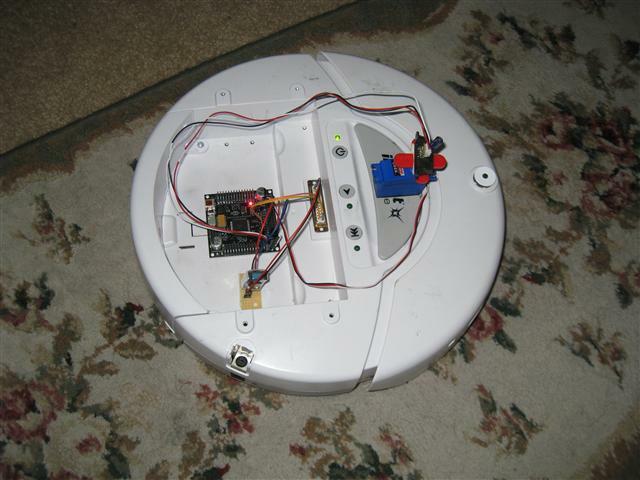 It’s an Irobot Create, controlled by an Axon 2 running Webbot’s Lib, a Sharp IR and a standard servo. Theoretically, obstacles in front of the robot will ‘repel’ it while free space ‘attracts’ it. The closer and more directly in the way an obstacle is, the more it ‘repels’ it away. 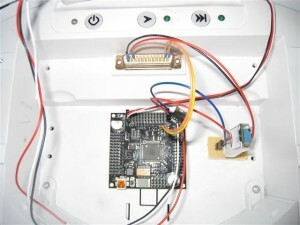 With Webbot’s new hardware project designer, it was a breeze to setup all the hardware, and I was programming in minutes. All in all my algorithm is only about 50 lines long. Everything else is taken care of by Webbot Lib and project designer. uf it is and for how many volt it is? I don’t know what I stuck in when i built this robot, but for a Sharp IR, anything over 10uF and over 5V will do fine. Do you have the source code for this project??? I do, but it is a bit messy. I’ll post the code in a day or two. Source added. It’s a mess though, not my best work. Kindly can I know how you connected the iRobot to another microcontroller? I am currently working on a project where I would like to connect it to XMOS XC-1 development kit or an atmel 8052 microcontroller. 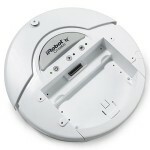 Kindly can you send me a wiring digram and really any general info about the iRobot as well would be highly appreciated.